Take a listen to “In Another Life” by Sandro Perri, from the album of the same name (out out on September 14 via Constellation). If I were ever not going to spend Canada Day in this country, I’d head to London. Every year, there’s a ton of Canada programming that takes place and this year, the event promises to be the best yet. 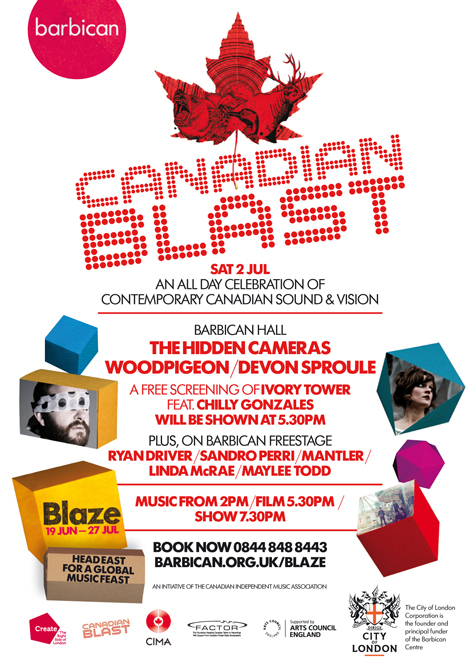 In addition to the Canada Day event taking place in Trafalgar Square this year (Blue Rodeo headlining a show with Polaris winners Karkwa and others), The Barbican Centre will be presenting Canadian Blast (as part of the Blaze Summer Concert Series) featuring The Hidden Cameras, Woodpigeon and Devon Sproule in the main hall (only London shows this summer for Hidden Cameras, Woodpigeon). In the run up to the main event, the foyer of the venue will also play host to a series of free shows featuring former Spirit of the West member Linda McRae, and solo performances from Mantler, Sandro Perri, Maylee Todd and Ryan Driver. At 5PM, Chilly Gonzales’ critically acclaimed feature film, Ivory Tower, will be shown for free in the main hall. The film features Tiga, Feist and Peaches. This sounds rad, check here for details.